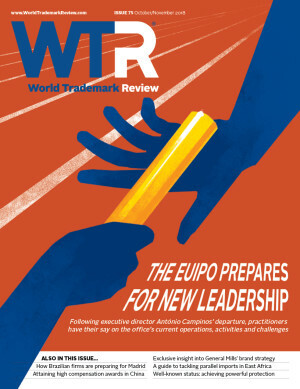 With the EUIPO looking towards a future under new leadership, we asked practitioners for their take on the office’s current operations and activities, and the challenges that the new management will face. In this week’s industry data report, we provide a rundown of the cosmetics market from a branding perspective. We take a big picture look at sales growth and key trends and reveal that technology trademark filings are on the rise among major brands. In this week’s data report, we examine the state of the trademark market in the Middle East, taking an in-depth look at filing trends in Bahrain, Kuwait, Oman, Qatar, Saudi Arabia and the UAE in particular. We speaks with Sergio Barragan of beverage giant PepsiCo to discover his approach to managing the company’s extensive Latin American brand portfolio. In our latest interview providing exclusive insights from leading corporate trademark professionals, we speak with Joshua Burke, senior IP counsel at US consumer foods conglomerate General Mills. In the first of our five-part series, trademark counsel from law firms across Europe provide an overview of the performance of their countries’ EU trademark courts over the past two years. In the second of our five-part series, trademark counsel from law firms across Europe provide an overview of the performance of their countries’ EU trademark courts over the last two years. In the third of our five-part series, trademark counsel from law firms across Europe provide an overview of the performance of their countries’ EU trademark courts over the last two years. In the fourth of our five-part series, trademark counsel from law firms across Europe provide an overview of the performance of their countries’ EU trademark courts over the past two years. In the final part of our series, trademark counsel from law firms across Europe provide an overview of the performance of their countries’ EU trademark courts over the last two years. In light of the recent Tempnology decision, parties and their trademark counsel must exercise more caution than ever when drafting trademark licence agreements. In China, the standards and methods for determining compensation in trademark cases directly reflect judicial protection levels. However, canny rights holders can choose strategies to maximise the chances of higher awards. After over a decade of debate, Brazil is expected to join the Madrid Protocol next year. But while accession seems inevitable, local practitioners have mixed feelings about the move. Obtaining well-known status for a trademark can be a powerful tool for rights holders. However, different approaches must be used to secure enhanced protection. This three-part series considers the best route in 10 key jurisdictions, starting with the United States. Different approaches must be used to secure protection for well-known marks in different countries. This article considers the best route in key Asian jurisdictions. Industry experts from the United States, the European Union and China outline the key considerations for those looking to expand their portfolios internationally. When it comes to exercising jurisdiction in online disputes, Indian jurisprudence has some way to go – but case law analysis may provide critical insight. Louboutin’s win before the European Court of Justice shines a light on the complexities of colour marks. Major amendments to Canada’s Trademarks Act are set to broaden the ability of brand owners to protect fluid marks, but will also introduce new obstacles to slogans. Fluid marks can breathe new life into a brand and are frequently used to grab audience attention. However, a trademark must be used consistently to maintain its registration. Fluid trademarks and slogans are excellent marketing tools as they engage customers and improve sales, but their enforceability remains challenging. Although branding companies and professionals have embraced the concept of fluid trademarks, it remains a highly complex field requiring close cooperation between IP attorneys and brand owners. Can fluid marks be considered part of a client’s IP portfolio in Mexico? Mexico recently introduced a number of legal amendments whereby the types of registration for distinctive signs were extended to include non-traditional marks. However, fluid mark protection remains a riddle. Fluid trademark strategies can strengthen brand recognition but the non-conventional nature of such marks needs to be understood to avoid weakening protection and risking non-use cancellation cases. Fluid trademarks are fun and innovative marketing tools for brand owners, but as there is no express protection for such marks in Turkey, they can be legally unstable and vulnerable.